Great hotel in a quiet area near Thamel. The views would be amazing if there was less dust and pollution in the air. Great breakfast, amazing staff, highly recommended. A charming place to stay, a short stroll into Thamel with great access to restaurants and public transport. The breakfast each morning is lovely and fresh, it can be eaten on the rooftop which provides great views and orientation of the city. Friendly and helpful staff. Very clean rooms. I highly recommend Avelon house! 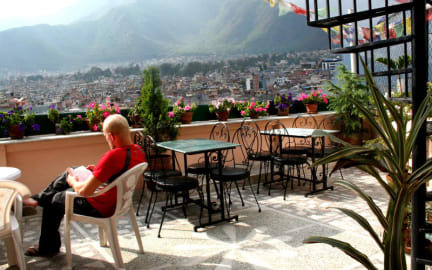 This hostel is perfect for a visit to Kathmandu. Saput and his staff are very friendly and helpful. No questions are stupid, and they can bring you safely to different parts of town with their private car for a small amount of rupi. Pickup and delivery to airport are also among the services they can offer. The hostel is close to Thamel street which is perfect for a good meal or to buy souvenirs/trekking gear. 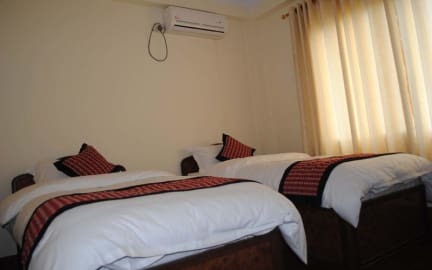 The rooms are clean aswell, some with a small terrace and a nice view of Kathmandu. I had a nice view from the balcony, room is big and clean. Hot water was also running well. Staffs were friendly and helpful, they let me leave some of my belongings there while we were away for a 6-day hiking trip. Nice! The facilities were basic but clean and had everything we needed, including a good hot shower. Saput, the owner, is super helpful and kind from arranging drivers to booking flights to giving general advice, you name it. The location is really convenient to Thamel but just far enough away to avoid the noise and crowds. The view from our balcony was great! All in all an enjoyable stay! Good breakfast! Staff very helpful and kind, they can arrange any tour for you at a good price. Room is big but a bit dusty. Overall everything was great for us at Avalon House. The staff were attentive and friendly, the location is great, the room was large, and the WiFi was solid. My main complaint would be that the towels they provided were disgusting, and smelled horrible after they got wet. IT'S TIME TO BUY NEW TOWELS GUYS!!! Really. Buy new towels. TODAY. The room we had was nice and had a good view off the balcony. The breakfast was basic but fair and included and the staff were friendly. Didn't enjoy the location very much, just off the main Street but otherwise a reasonable place to stay. Easy to get to Thamal from the hostel, the staff were helpful when we wanted to book taxis (although the taxi was definetly part of the hostel and might of cost a bit more than normal). Atmosphere of the hostel was non-existent, that could of been because we were there in off-season so not many other travellers. Offers a breakfast each morning, not the best but it’s nice to get a free cooked breakfast that they’ll bring to you on the rooftop.